Brendan Rodgers believes Philippe Coutinho is moving toward the peak of his natural talent as the Brazilian playmaker prepares for his second full season as a Liverpool player. The No.10 arrived at Anfield in January 2013 and has bewitched Kopites ever since with his sublime range of passing, acute vision in tight spaces and unflinching desire. Not travelling to the World Cup in his home country allowed Coutinho to enjoy an extended break during the summer and he has shone since returning to pre-season last month. "Philippe will probably be glad now he didn't make the World Cup squad," the manager reflected. "I can only gauge it on how he was mentally and physically coming back. "He came back with a great level of fitness - right on the limit of his weight. He's in great condition, he clearly worked hard in the off season and since he's come back we've seen in the games how strong and aggressive he is. 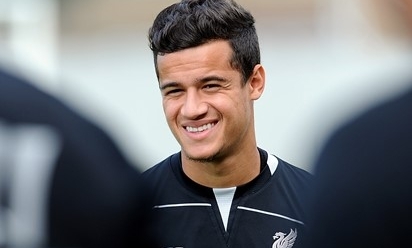 "He's 22 and hopefully by the time the next World Cup comes around he will be an important part of the Brazil team. I'm sure his best years will be at Liverpool. "He's certainly a valuable player and a great asset to the club. He's come in here and shown his quality, and really developed as a young player. Now he's moving into the best years of his life as a footballer."